Contact us to schedule a demonstration at your airport or to obtain a sample! Type-S Slurry is best suited for business, residential, intermediate roadways and large acreage parking lots. 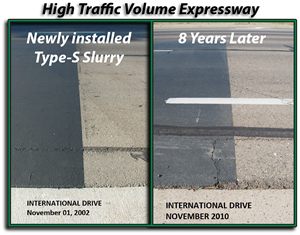 Adhering to the ‘right treatment, on right pavement, at right time’ preservation philosophy, theType-S Slurry works best in settings where pavement is less than 10 years old with an index above 65. 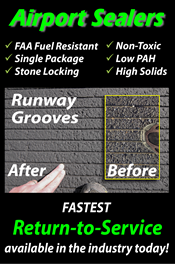 The surface treatment works well with pre-patching/ cracksealing to restore surface appearance, ride quality while protecting pavement asset from further oxidative hardening. Also, Type-S Slurry has excellent synergy when applied as a cape seal over chip applications – provides road calming and stone locking. Type-S Slurry has excellent resistance to marking/tracking, leaves concrete driveways clean and no aggregate raveling to maintain neat appearance. TYPE “S”: Roman numeral for 1/2. When a type I is too loose & big and a seal coat is not enough. STRONG: High temperature, tire scuff resistant to power steering abuse. FAST CURE: May cure in less than twenty (30) minutes, in optimal conditions, to a track free surface. VERSATILE/CUSTOMIZABLE: Chemical resistance, rate of cure, final surface hardness and skid characteristics can be modified to meet local specifications. FRIENDLY: Safe to handle and store. WATER Soluble: Easy clean up with water. Type-S Slurry - is a permanent, cost effective, substantially more durable pavement preservation alternative for parking lots and driving lanes. 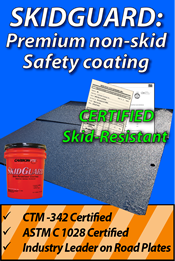 Replaces conventional top coats for all pavement surfaces from freeways to airports. Available – 55 gal drums & 250 gal totes.